Washington, the Evergreen State, you fly into the Seattle-Tacoma International Airport, peering out the window to see human civilization existing as an ant farm below. Then, right beside you, Mount Rainier eclipses all that had stretched underneath, beyond the horizon. The plane is flying just a little higher than the summit (well, a few thousand feet above, but in relative terms, the difference matters little) and soon the plane will fall far below that white peak. Nature greeted me spectacularly in Washington, and left the greatest impression by far throughout the entire trip. Even on the roads surrounding Seattle, the view is dominated by the towering evergreens, hogging all the attention. From a distance, the city was only visible where humanity had made it so, pushing back the forest to build a parking lot or something of the sort. On my first day there, we went to a Walmart marking lot to get a good view of Rainier. It sounds weird, but that’s how it was. In the parks as well, it felt like moving through a massive, green curtain, the forest parting a little on the trail before you and then seeming to close behind you. Everything was alive, it was primeval. On the forest floor, mosses and ferns invaded the surface of the numerous fallen tree trunks, which lay about in various stages of disintegration. It seemed ageless, the taint of death conveyed by such scenes was overridden by all the life that sprung from it. This cycle of birth and rebirth stretched thousands of years before recorded history. The majority of the earth is not alive. There is a molten core, a soft mantle, a shell of a crust, all composed of elements formed in Space eons ago by miraculous chance, but without a memory to recall or a reason to give for why it’s there. But in the wilderness of the Northwest, life rises and conquers, with a clear purpose: to stay alive. Life clung to the faces of the cliffs, competed for dominance, rising high in the forests. As I moved along the trails, occasionally an opening in the vegetation along a high ridge or at a riverbank would appear, and give little hints of the earth’s violent revenge upon the invading forest. The Cascades get their name from all the streams cutting across them. Everywhere there was water. 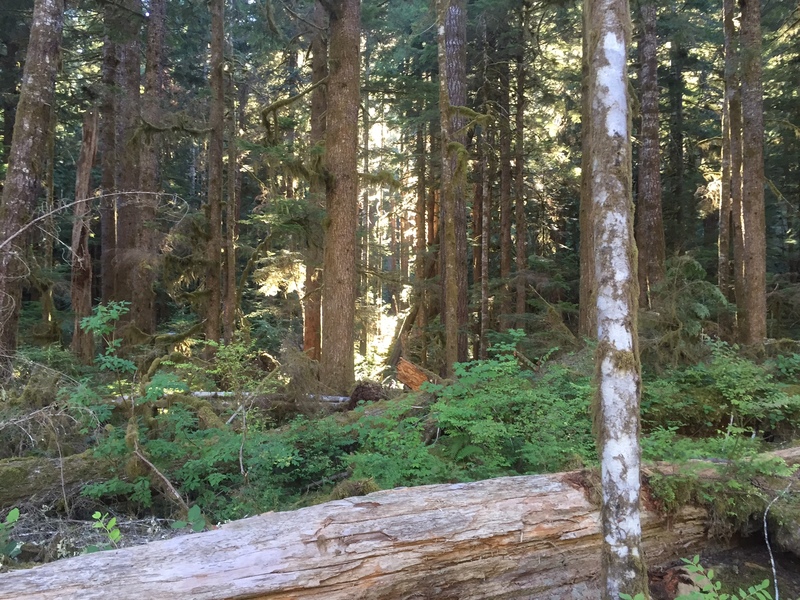 The forest there is a temperate rain forest, receiving 10 ft. of rain per year in some areas, all rushing down to the valleys, dragging bits of the mountains with them in the spring torrents that rage through the valleys, ripping up vegetation. A glacial stream jets down the mountainside from beneath a glacier atop Mt. Rainier. 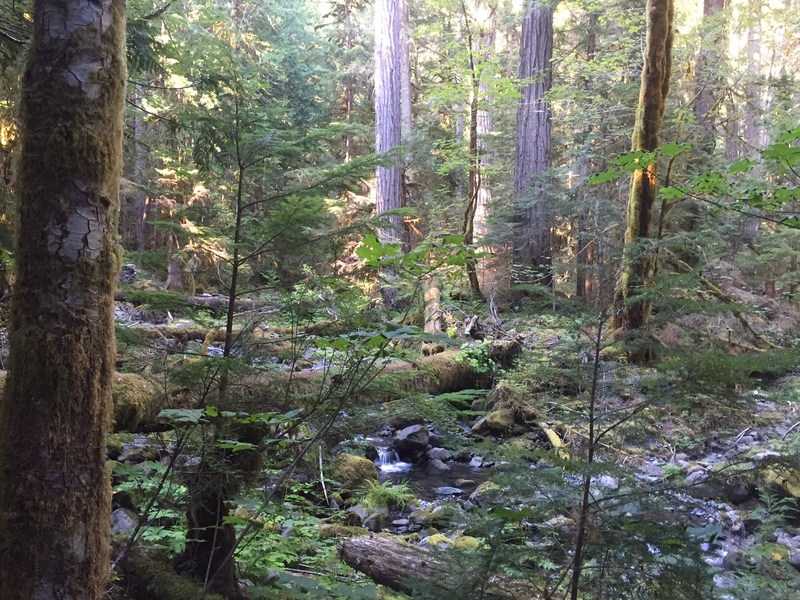 It was a strange dichotomy: the serene forest, soft vegetation, interspersed with streams, scattered with big, jagged boulders and massive, splintered logs. All of the conniving, the adaption, the selection that had brought those trees to their monumental height had been wiped away by a cold, mindless aspect of Nature representing nothing but the passage of time, the expansion of cracks by ice, the ceaseless torrents of water that run over the surface of the mountains. Such expositions, revealed by the parting curtain of green, inspired the more nihilistic tendencies hidden within my temperament to bubble to the surface of my consciousness. Is life simply a journey into inevitable destruction and tragedy? A lot of introspective thought took place, as it does with many people who visit the parks. People often lament that they have to hide pieces of themselves from others, in order to be accepted by society. But imagine if you could pull those pieces out of your head, like dominoes, or better yet: like little pieces of coal. How would the pile of that which you hide from others compare to the pile of that which you hide from yourself? It seems that the more time passes by, the more difficult it can become to tell the difference between who you are and who you want to be, as one or the other of these piles grows larger. Quiet reflection in nature can mend that. As John Muir said: “the clearest way into the Universe is through a forest wilderness”. This is the sort of inspiration that softies like me get from nature, but to others it can blaze all sorts of new paths into the unconscious mind. The parks were filled with people from all over the world, each seeking something else from the experience. Some weren’t seeking answers. They didn’t look at a mountain and see into themselves, they saw a natural wonder rising without regard for human intervention. Either way, it’s amazing. The Cascades and the Olympics are the two mountain ranges that dominate the area. On the ferry from Seattle, one can look west and see the Olympics rising in the distance, to the East the Cascades loom, the view dominated by Mt. Rainier, which looks to a flat-lander like me to be very close, but in actuality it’s over an hour’s drive away. The Cascades are a volcanic mountain range, pushed up as oceanic tectonic plates are forced under the Continental plate of the West coast. The friction between these plates both folds the surface of the earth, and superheats water contained in the crust to the point where the rock around it liquefies and forms magma chambers. As the pressure and the heat beneath the earth pushes this magma to the surface, volcanos, like Mt. Rainier, Mt. Baker, and Mt. St. Helens are formed. 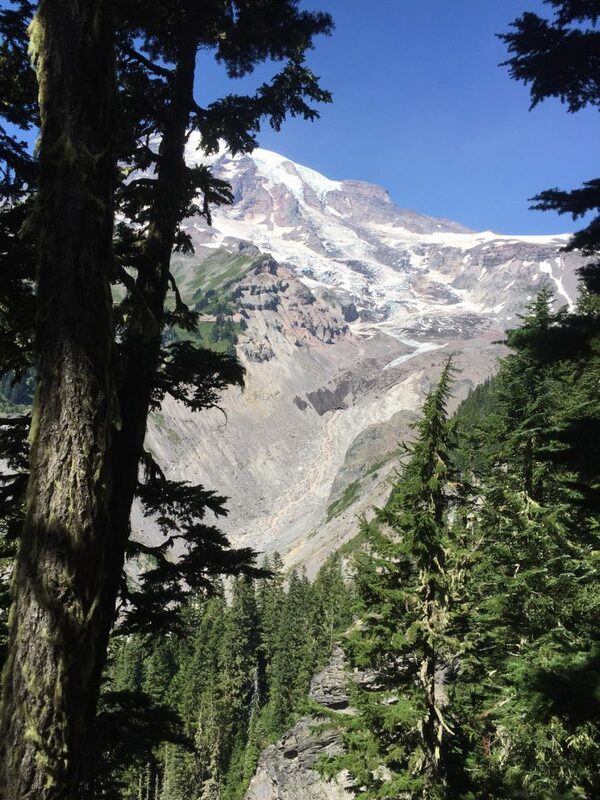 Volcanic activity has been occurring in the Northwest for 37 million years, but the biggest volcanic peaks you see today are around 5-7 million years old. 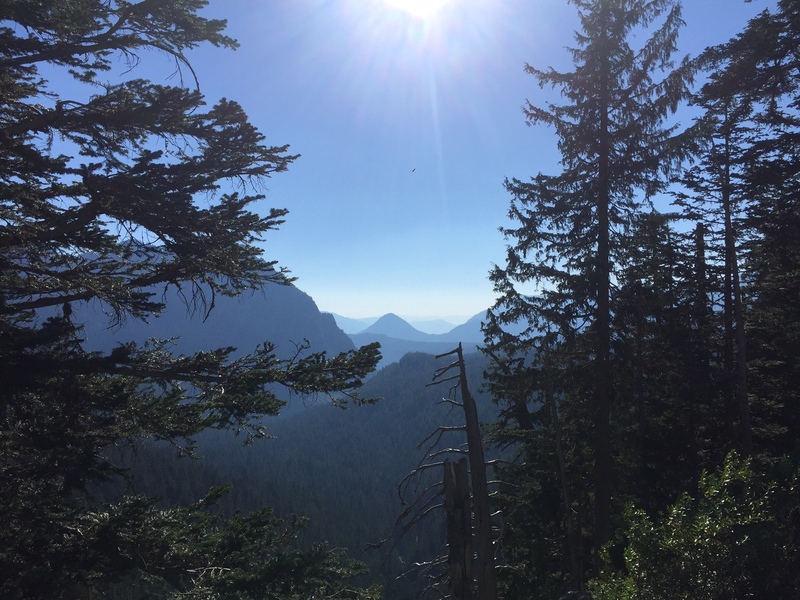 The big mountains of the High Cascades formed as a result of the disintegration of the oceanic plate (the Juan De Fuqua plate) and the steeper subduction of its parts beneath the continents, causing the Cascades and Olympics to rise higher than they ever had before. Many know of the massive eruption of Mt. St. Helens in 1980. In the episode, the largest landslide in recorded history was followed by a pyroclastic flow that scorched the earth for miles around. The “scorch zone” covers over 140 square miles. Go there today and green life is invading from all margins of the area, but it still looks almost like a desert beneath the crater of the volcano. The topsoils of the ridges to the North were stripped away by the force of the slide, and the valley below was buried up to 131 feet thick in jagged pumice, in which few plant can grow. Even 30 years later, the 6 square mile pumice rock plane to the North of the mountain supports little life. A view of Mt. St. Helens from Johnson Ridge. It Should be noted that at this altitude, there was never thick forest riding up the peak. Still, after the blast the variety of vegetation to be found has been greatly diminished. The blast of Mt. St. Helens was on an unimaginable scale. 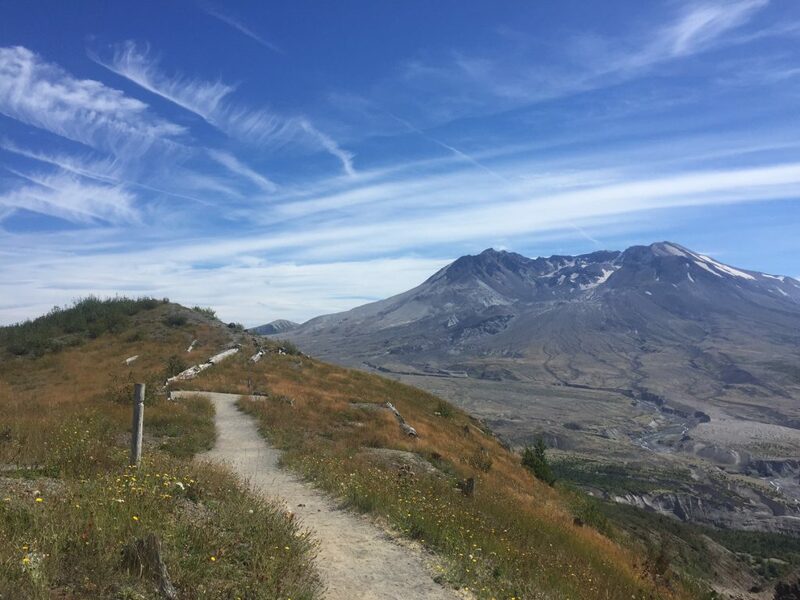 In response to an increase in volcanic activity prior to the eruption, a USGS station monitoring the mountain had been moved to a new position on Johnson Ridge to the North, which was considered a safer location. The station, however, was wiped out within seconds after the landslide began. And although a volcanic catastrophe on such a scale was unprecedented in American history, scientists predict that an eruption of Mt. 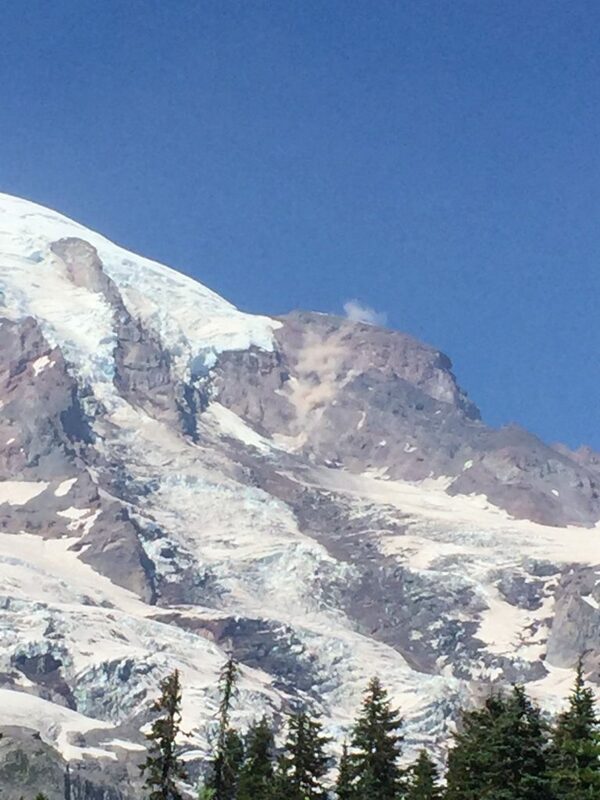 Rainier would dwarf that of Mt. St. Helens. The back country trail that borders the Mt. St. Helens National Monument. This may sound absolutely terrifying to some, but to me there is a positive message spoken by the green of the treetops and the leafy tendrils of the ferns, swarming in ever so slowly from the edges of the pumice plain. Eruptions like these have gone on for millions of years. Mt. 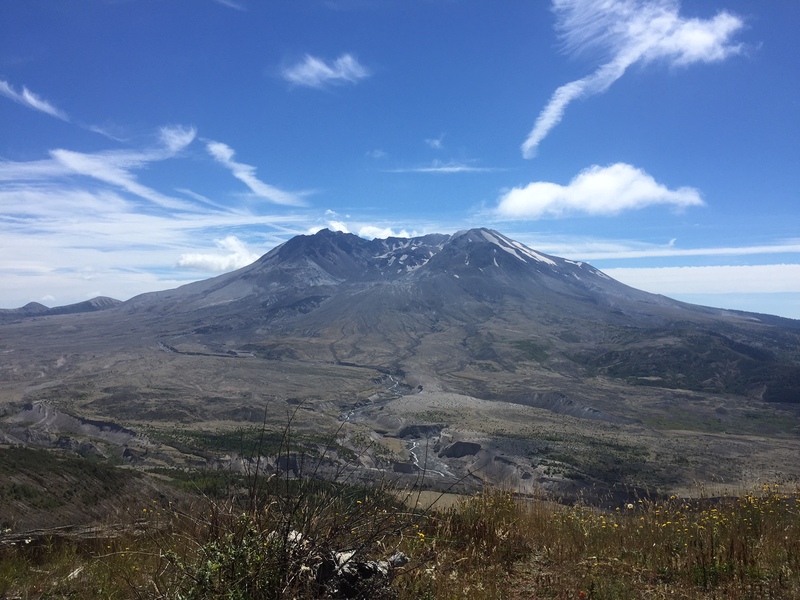 St. Helens is, at around 40,000 years old, one of the youngest in a long lineage of volcanic peaks in the Cascade Range. It has erupted innumerable times in its thousands of years, as have other volcanos in the area. Mt. Baker erupted in 1880, and Mt. St. Helens went through a prolonged eruptive phase for the first half of the 19th century. These were not are as powerful as the 1980 episode, but in 1480 an eruption several times larger than the one in 1980 occurred with dramatic effects to the landscape and life around, and then was followed in 1482 by an eruption which would have rivaled the one 30 years ago. Besides volcanoes, there have been other catastrophic events occurring throughout the history of the Northwest. During the height of the Ice Age, ice-dams created a massive lake, called Lake Missoula, in the Northern Panhandle of Idaho. Occasionally these dams would break, creating floods greater than any in recorded history. These floods ripped through the landscape, carving the physical features of the Columbia River Basin. Before that, between 15 and 17 million years ago, floods of basalt covered Eastern Washington and Oregon, in some cases flowing all the way to the pacific. These lava flows are possibly the result of the mantle plume that currently rests underneath Yellowstone. Geologists sometimes call them “hot spots” because these plumes of magma are not the result of tectonic subduction like in the Cascades, but originate from the earth’s mantle. Despite all of this, life has returned, constantly struggling to carry on. Massive conifers bear thin rings attesting to the rough conditions they faced as a result of the 1480 Mt. St. Helens eruption, but they live on. The basaltic flows which would have exterminated all life they touched in the region are now cloaked in verdant green blankets of vegetation. If the Pacific Northwest has a lesson to teach, it is that earth’s ability to foster life is equal to its ability to destroy it. 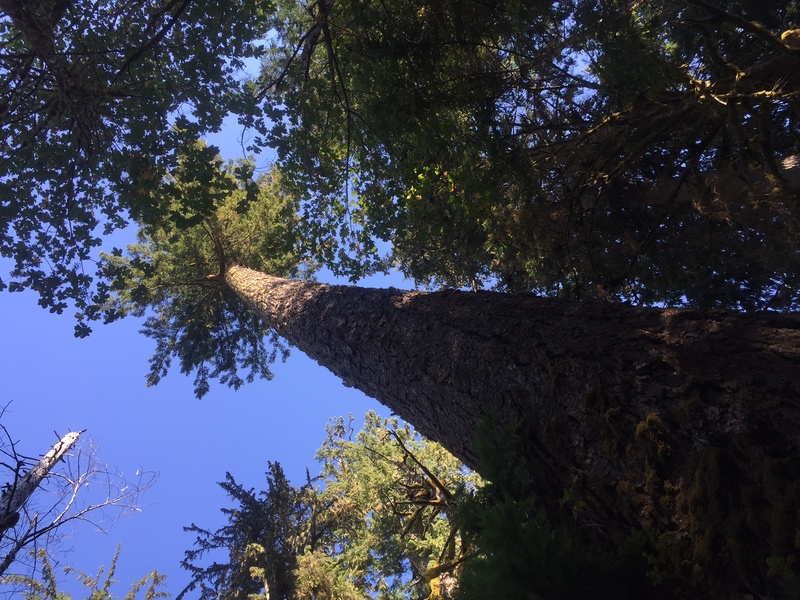 To see petrified example of one of the large species of trees to be fount in the Pacific Northwest, as well as many other examples of trees found all over the Unites States, as well as animals fossilized in volcanic lake environments, check out out Morian Hall of Paleontology. Previous Post The Great Sweet Potato Mystery! Next Post ‘Shaken, not stirred’ is more bond than you think! How The Core Controls Us All. The Earth’s Core, That is.